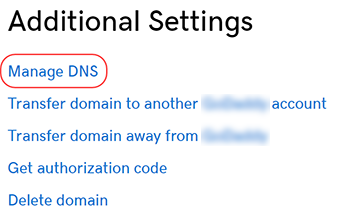 You can edit an A record in your DNS (Domain Name System) zone file for a domain registered with GoDaddy. An A record connects your root domain name to an IP address and lets web browsers find your website. A records are commonly used to point to a hosting account, or to create a subdomain. If your domain is not registered with GoDaddy, you can edit an A record using DNS hosting. Host The host name the A record links to. Type @ to point directly to your domain name. You can add a new A record at any time. Or you can delete an A record if it's no longer needed. A Record change has not applied after 4 days.